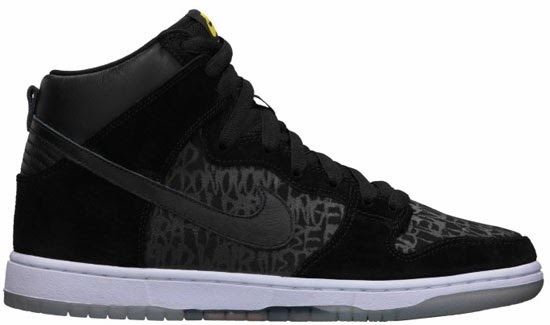 This all new Nike Dunk High SB is now available. A part of the Nike SB "Chronicles Vol.2," this Nike Dunk High Premium SB is known as the "Neckface" edition. They come in a black and black colorway featuring a black based upper with a white midsole sitting on an icy translucent outsole. A subtle graphic on the upper features names of Nike SB riders in the video: Shane O’Neill, Ishod Wair, Daryl Angel, Theotis Beasley, Donovon Piscopo, Justin Brock and Luan Oliveira. These are a limited release and, they are now available at select Nike SB accounts worldwide an dropped today Tuesday, December 3rd, 2013. Retail is set at, $108. 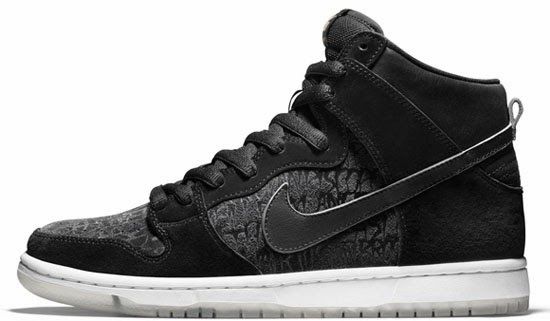 Enjoy the official images below of the "Neckface" Nike Dunk High Premium SB in black and black. If you're interested in picking these up, check in with your local skate shops to see if they received them. Those of you looking for a pair now can, grab them from eBay here.